With more than 1900 full-time faculty, $302 million in research awards and more than 500,000 square feet of dedicated research space, IU School of Medicine is well-equipped to take on bold medical research projects that promote groundbreaking scientific discovery while improving health care interventions, patient care and health outcomes. In the most recent fiscal year, IU School of Medicine received nearly $320 million in total research grants and awards, including $126 million from the National Institutes of Health. Anantha Shekhar, MD, PhD, executive associate dean for Research Affairs, oversees IU School of Medicine’s research enterprise. He also has served as the founding director of the Indiana Clinical and Translational Sciences Institute since 2008. 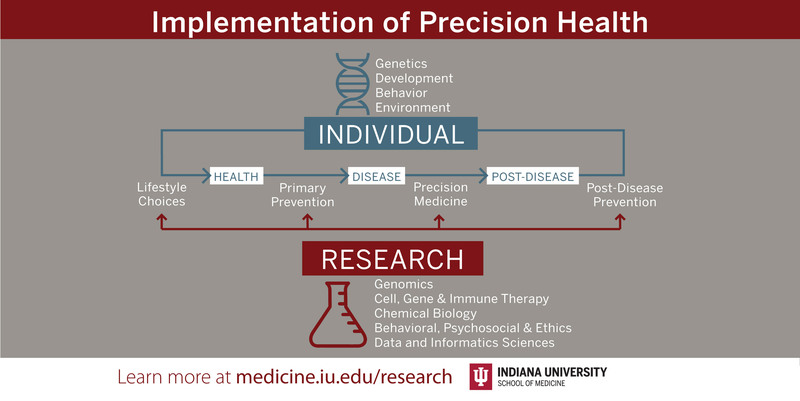 IU School of Medicine’s Precision Health Initiative is the inaugural recipient of funding through Indiana University’s Grand Challenges Program, which will help IU School of Medicine and its partner institutions understand and optimize the prevention, onset, treatment, progression and health outcomes of human diseases through a more precise definition of the genetic, developmental, behavioral and environmental factors that contribute to an individual’s health. Developed by a team of researchers and physicians led by principal investigator Anantha Shekhar, MD, PhD, this initiative will transform biomedical research, health care innovations and the delivery of health interventions in Indiana. 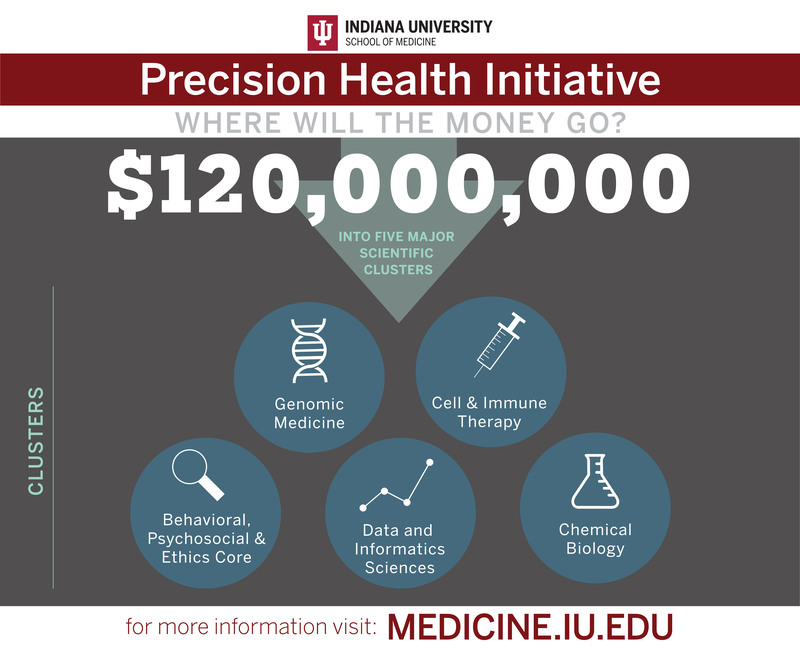 The Precision Health Initiative will receive as much as $40 million in funding from the Grand Challenges Program, along with $80 million invested by IU School of Medicine. The Precision Health Initiative is an ambitious plan that will cure at least one cancer through the development of new cell, gene and immune therapies and develop novel disease-modifying or prevention methods for adult neurodegenerative diseases such as Alzheimer’s Disease. It will also use gene and other therapies to cure at least one genetic pediatric disease. This initiative involves collaboration with industry and community partners, including Eli Lilly and Co., Roche Diagnostics, Cook Regentec, Deloitte, Regenstrief Institute and IU Health. Where Will the Precision Health Money Go? IU School of Medicine is one of 29 organizations selected to receive funding as part of the $685 million Transforming Clinical Practices Initiative created by the Centers for Medicare and Medicaid in the US Department of Health and Human Services to drive changes in the practice of medicine—to help clinicians improve health and health care while lowering costs. Given four years and $46.4 million, IU School of Medicine is leading a project to support 11,500 physicians, advance practice providers and clinical pharmacists in Indiana, Illinois and Michigan. IU School of Medicine investigators conduct world-class basic, translational and clinical research in a broad range of scientific endeavors. Neuroscience, cancer, musculoskeletal and diabetes/cardiovascular/metabolic disorders have been designated as research priority areas and represent the school’s areas of expertise. Strategic themes within each of those priority areas are precision medicine, population health, cell-based therapy and life-span research. Stay current on medical research progress at IU School of Medicine by exploring and subscribing to the research blog.